Heater Shop is a trading division of Edison House Trading Ltd, specialising in the distribution of products via the Internet and by an internal technical sales team. We supply quality products that can be easily purchased at your own convenience, recognising the importance of supplying quality products at reasonable prices, with full technical advice and a free of charge design service. Understanding all the benefits and advantages of our product range, we can supply and advise you the correct products for your project and are continually striving to improve our customer service. Heater Shop is an electrical specialist with 31 years' experience trading. We are able to use our electrical expertise to ensure that we only supply good quality, value for money products, backed by the support and expert advice of our team of electrical engineers. At Heater Shop we use Feefo, an independent third party review service to generate our customer feedback. This review service is a closed invitation-only platform, thus guaranteeing every single review we have received is matched to a genuine customer who has transacted with us. Read our feedback on our Feefo profile . We only stock quality products we test and believe in and we are constantly sourcing new products that represent innovative technologies and good value for money. To ensure we provide excellent customer service we are trained and approved specialists in Rointe, Elnur and Haverland heaters and understanding all features of these product ranges enables us to help you make the very best decision when choosing your heating solution. We regularly check and compare our products online, matching prices and delivery service, and we offer bulk pricing (POA) for large quantities or projects. We're confident you can't beat our price, but if you find one of our competitors has the same product offer or is cheaper we'll beat theirs. This is our price match promise. Please contact us on 01473 276686 for further information. If you have any questions or queries our technical advisors and sales team will do their very best to assist you. We can offer expert technical advice as well as offering a free of charge design service and an accurate heat loss calculation of your property. Our online room size calculator offers a simple, quick and personalised answer to calculate the theoretical heat loss of your rooms and work out what wattage and how many radiators, panel heaters or storage heaters your require. Please note, our calculations are to be used as a guide only and our estimated recommendations should be considered as an average depending on location, room orientation and insulation. For a more accurate heat loss calculation please contact us on 01473 276686. At Heater Shop we take your security seriously. Each stage of our online checkout process and our customer account centre is protected by 128 bit SSL encryption and all online payments are securely processed through SagePay, an independent payment service provider. We do not retain any credit card information in our systems as per our security policy. 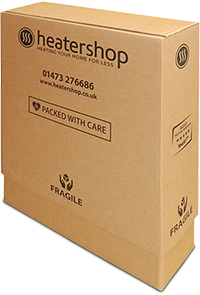 At Heater Shop we take pride that our heaters are packed and shipped directly from our fully stocked warehouse. Our warehouse is a highly organised operation with our warehouse manager leading the way. The warehouse staff pick, pack and help load all deliveries from 7am until our next day cut off time, each day ensuring that you receive your courier tracked consignments on time with our trusted couriers. All products are well packaged with polystyrene or bubbling, and palletised where necessary, to prevent damages during transit. Due to the fragile nature of some of our products, we have also designed our own unique packaging to further secure your delicate goods during transit. This may mean you have slightly more packaging to dispose of in your recycling - but we're pleased to say that we've had no occurrences of damages during shipping since using our new packaging! Each delivery we ship through our third party couriers provides a tracking code so we always know where your goods are, once they leave our warehouse. Our local trade counter is located by our warehouse in Ipswich, Suffolk. Please contact us on 01473 276686 for directions or find our full address on our contact us page. We are able to offer collection of goods and showcase new and existing products. Our sales and technical team are always on hand to answer technical questions and offer advice in person when you need it!